Successfully Added Wireless Presenter with Green and Red Laser Pointer to your Shopping Cart. 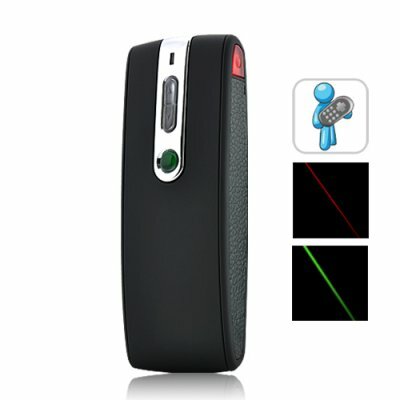 The Wireless Presenter with Green and Red Laser Pointer is a SMALL device that makes a BIG difference. It allows you to choose either the green or red laser to direct the audience's attention towards important points at the presentation and go from slide to slide and free themselves from the keyboard and mouse. With this ergonomically designed device you can now finally walk around in their presentation and feel confident to impress the audience. Two colors, one pointer: Combining the advantages of both a red and green lasers, this product is 2x more useful then other laser pointers. You can use the red laser pointer in low light situations while use the brighter green laser pointer in outdoor environment, bright rooms, or on LCD or Plasma screens. Not just a presentation aid device: the Wireless Presenter with Green and Red Laser Pointer with a 5 MW output is a class IIIa laser pointer and is safe to carry around. With a visible range of more than 10 meters, it can be used in various applications where pointing out details by hand is not convenient. Use it to show specific details in construction sites or light up the key hole in dark nights. The applications are simply unlimited! A presenter with laser pointer is a basic item that every online store should have. The Wireless Presenter with Green and Red Laser Point with its various features stand out from your competitors' average products. Add it to your online store and enjoy the profits it brings. Brought to you by your source of China factory direct electronics - Chinavasion.